Due to inferior construction management, bad practices in concrete construction may happen at the construction site. Bad practices in concrete construction lead to inferior quality of the constructed service as well as the security of the construction is also significantly affected. The construction workers and professional must abide by the good construction practices on the construction site. The top-level management along with the work contractors and sub-contractors should monitor these practices so that these are accomplished according to need. (a) Inferior Construction Method and Workmanship: Inappropriate training, deficient quality, and negligence are some of the vital concerns for the inferior workmanship and construction methods. 01. Increased Water Content in Concrete Mix: Greater water content to get high workability is a harmful practice. 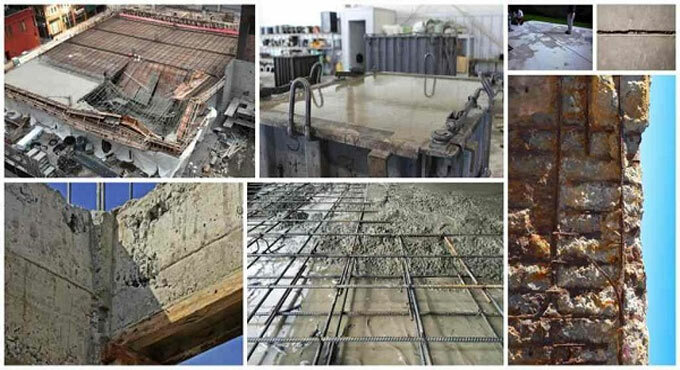 With surge in water content, the porosity and the permeability of the concrete will be raised and as a result the corrosion will occur in the reinforcement. The elementary strength of concrete will also be decreased significantly. The supervisors and site in charge should make proper checking to maintain the perfect amount of water-cement -ratio. 03. Bleeding of Concrete: Because of extreme water content and over vibration, bleeding in concrete primarily happens. Bleeding can lead to severe pores and permeability in structure. 04. Inappropriate Curing: Inappropriate Curing is caused by carelessness of the workmen and site supervisors. Proper curing plays a significant role in the hydration of the cement particles in the concrete. The properties of concrete as well as the performance and stability will be increased with superior hydration. For improper curing, the loss of water will be acute. In future, it will lead to cracking and shrinkage in the concrete structure. It should be kept in mind that there should be fewer water throughout concrete mixing/concreting and sufficient water after curing. But in construction site, this theory is not followed. 05. Problems with Reinforcement Details: The reinforcement should be arranged properly to get the required performance of the structure. If the steel reinforcement is arranged imperfectly, it will cause insufficient cover that will enhance the risk of corrosion in concrete. Improper placement of the reinforcement will cause collapsing of building when the structure remains under complete service load. The bars should be arranged all along the length according to drawing to obtain fixed/pinned joints and should be perfectly lapped and staggered. Insufficient cover of concrete will cause the risk of the moisture and consequently leads to penetration of the water. Thus, cracking, and spalling will happen because of corrosion in concrete structure.